A boiling water reactor (BWR) is cooled and moderated by water. It takes place at a lower pressure as in PWR, what allows the water to boil inside the pressure vessel producing the steam that runs the turbines. A boiling water reactor is cooled and moderated by water like a PWR, but at a lower pressure (7MPa), which allows the water to boil inside the pressure vessel producing the steam that runs the turbines. A BWR is like a PWR but with many differents. The BWRs don’t have any steam generator. Unlike a PWR, there is no primary and secondary loop. The thermal efficiency of these reactors can be higher, and they can be simpler, and even potentially more stable and safe. But the disadvantage of this concept is that any fuel leak can make the water radioactive and that radioactivity can reach the turbine and the rest of the loop. The reactor core inside the reactor vessel creates heat (e.g. 3900MW). A steam-water mixture moves upward through the core and absorbs this heat (typical Tin=215°C and Tout=285°C). The steam-water mixture leaves the top of the core and enters the two stages of moisture separation where water droplets are removed before the steam is allowed to enter the steamline. The “dry” steam then exits the reactor through main steam lines and goes to the turbine. The turbine drives the turbine generator, which produces electricity (e.g. 1300MWe). The unused steam (45°C) is exhausted to the condenser, where it is condensed into water. The secondary side of the condenser extracts the waste heat (2600MW; 30°C) and the waste heat is released into environment. 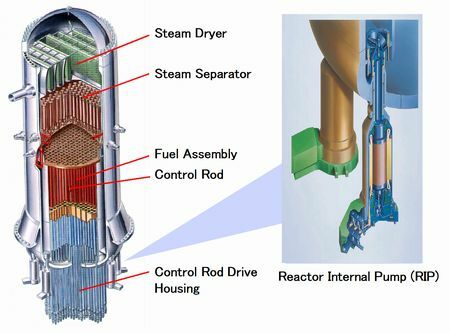 The resulting primary water is pumped out of the condenser with a series of pumps, reheated, and pumped back to the reactor vessel. Simlipied scheme of plant with boiling water reactor.